Automated Kinematic Viscometer Measuring Head with nIR detection system. Suitable for use with RPV-1 Polymer Viscometer systems, AKV and BioVis systems. Accommodates AKV Ubbelohhde viscometer tubes and RPV Ubbelohde viscometer tubes. Replacement measuring head for use with RPV-1, AKV and BioVis automated kinematic viscometer system. The measuring head from PSL Rheotek comprises of a specially designed viscometer holder. This viscometer holder accommodates a PSL Rheotek Auto Ubbelohde Viscometer tube. 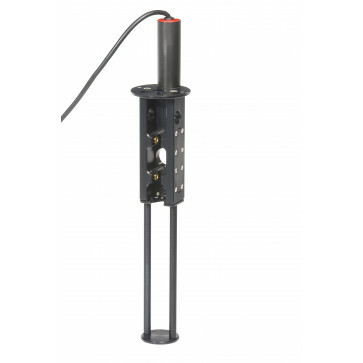 Incorporate in the legs of the holder is a flow time detection system designed with nIR emittors and detectors.